There are so many parts of Edmonton that I have yet to fully appreciate, and I am grateful when opportunities arise to encourage further exploration. When it involves food, I’m even more likely to participate – so the first ever Olde Towne Beverly Dining Week is right up my alley. Eight restaurants in Beverly are showcasing their fare from October 5-13, 2018, ranging from long-standing establishments to several newcomers to the neighbourhood. I had the chance to visit some of these restaurants with my friend Freya on Wednesday during a media preview event, and was pleasantly surprised by the diversity and the sense of community evident that night. Wild Heart Collective (the folks behind Eats on 118 and the 124 Grand Market) worked with the Beverly Business Improvement Area on developing the event. 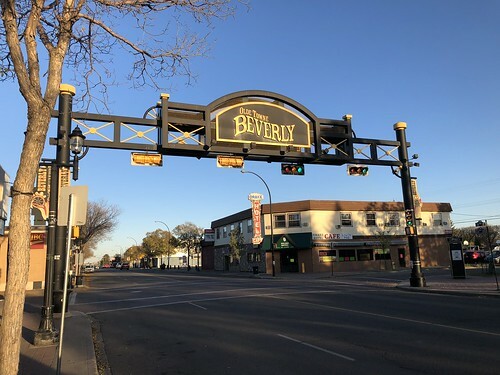 Wes Robson, the Executive Director of the BIA, said Beverly is an often forgotten part of Edmonton. That’s definitely been the case for me – I haven’t been back to the area since I visited the farmers’ market a few years ago (with a pit stop for doughnuts from Take 5). 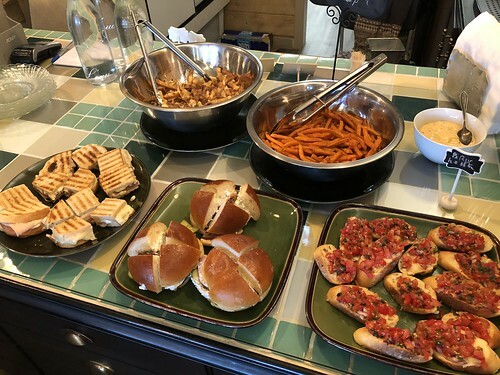 After the tour, I could easily see myself returning to spend an afternoon in Beverly, having lunch and picking up groceries and dessert to go. Two of our stops highlighted the Ukrainian heritage of some of the original settlers in Beverly. Uncle Ed’s is a city institution, and one restaurant that has been on my to-visit list for ages. Collette Hennig, whose grandfather opened Mundare’s famous Stawnichy’s in 1959, is now the third generation to run the family business. Her daughter has recently been dipping her toe in operations as well, something that is great to hear. Although the first Edmonton location opened in 1986, the current iteration of Uncle Ed’s has been in Beverly for twelve years. The shop is split between a grocery store offering Stawnichy’s meat products and frozen goods, and a family-friendly restaurant serving up Ukrainian comfort food at very reasonable prices. Their Dining Week special is a sampler plate, featuring perogies, sausage, cabbage rolls, baked cheese bun, cheese crepe, and homemade pie for dessert. Based on our tastes of these items, I’ll be back for a full serving very soon. I hadn’t heard of Widynowski’s Sausage House prior to the tour, but it turns out they also have deep roots in Beverly, having been in operation there for 34 years. Tyler Hawryluk, whose father and uncle started Widynowski’s in 1984, has since taken over the business, and shared that everything in the shop is still hand made. 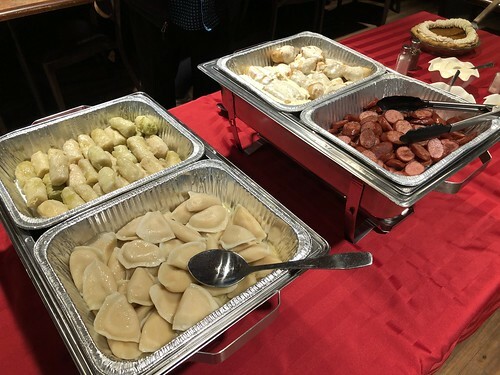 They have a selection of sausages and jerky, in addition to frozen perogies, cabbage rolls, and other Ukrainian delicacies. 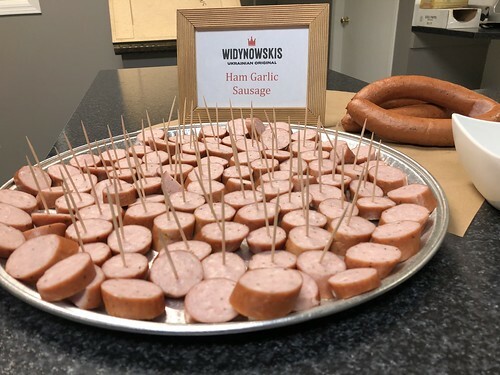 The ham and garlic sausage we tried was delicious, and is included in the take-home bundle Widynowski’s has put together for their Dining Week deal. We also sampled the fare from two more recent establishments. The first was Old Beverly Cafe, opened by Rachel and Michael Benti in January. 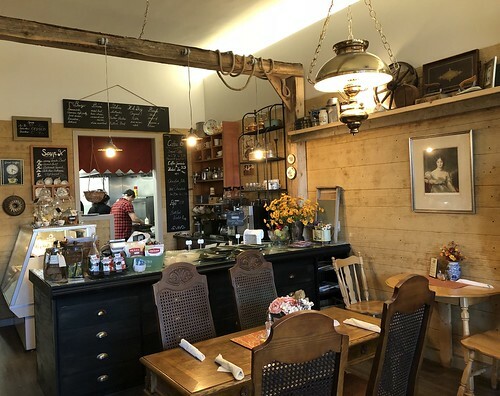 Although the interior has been designed to resemble the mine shafts that recall the coal mining history of Beverly, the menu is much more eclectic. That night, we sampled poutine, paninis, and their Dining Week specials, bruschetta and a Mediterranean burger, with tzatziki atop a lamb patty. It’s a cozy little spot that I wouldn’t have thought to encounter in Beverly, charming and quaint. Their breakfast menu looks particularly intriguing, with a breakfast poutine that I wouldn’t be able to pass up. Nalaz Kitchen is another newcomer to the neighbourhood, having opened in January. The couple behind the restaurant is originally from India, but the chef has extensive experience in international hotels and cruise ships, inspiring a menu they describe to feature “Indian flavours and Canadian tastes”. We sampled several of their savoury dishes, including a curry poutine, chicken tikka burger and fish and crisps. The spice level was tuned for more moderate palates, but everyone around our table enjoyed the plates. 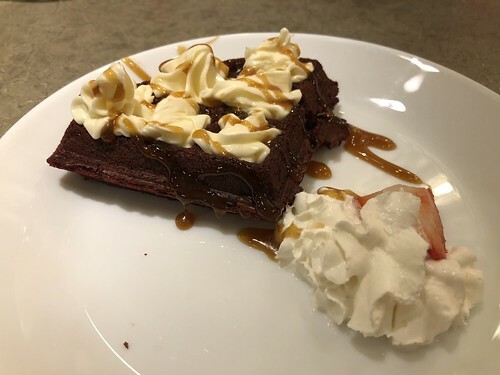 The highlight of the meal, however, was dessert – a red velvet waffle with cream cheese frosting that silenced the room. If one were to plan a food crawl in this area, Nalaz would be the ideal choice to end the evening. Swiss 2 Go is well-known to many in Edmonton for their scratch-made sandwiches. Originally from Switzerland, Drita Keller and her family moved to Edmonton in 2012, and opened up a small cafe in Beverly. Although they moved to a location across from West Edmonton Mall for a few years, Drita said they didn’t find the community they were hoping for and so, returned to Beverly again about three years ago. Drita is a consummate host, and warmly hugged each patron before we departed. It’s amazing she has the energy she does, given she starts working at 3:30am to ensure the shop is stocked with freshly baked pretzel buns each day. Given the foundation of a great sandwich is the bread, it’s no wonder why Swiss 2 Go has the reputation it does. 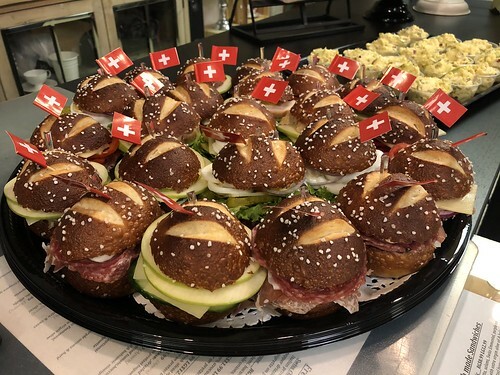 The ingredients are fresh (the sandwich I tried featured prosciutto, salami, bocconcini, and sundried tomato), but it really is the pretzel bun, studded with rock salt, that sets is apart. During Dining Week, a select variety of their regular and large sandwiches are 20% off. 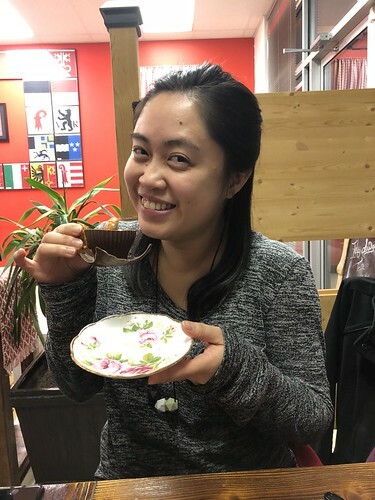 Their desserts, also handcrafted, were made for Instagram, served in a molded chocolate teacup. While it probably helped that board members of the Beverly Business Improvement Area were among the group that night, we felt very welcome at each of the establishments we visited. Nearly all of the business owners mentioned that they felt a kinship with the community, and indicated that they felt well supported by the residents. Well, it’s about time that this well kept secret is shared with the rest of Edmonton! Thanks to Wild Heart and the Beverly BIA for a wonderful evening! Check the Beverly BIA website for more information about Olde Towne Beverly Dining Week.